Two cheers for the Champions Trophy? Not so long ago (August the 24th, to be precise) the cricket world was given some perhaps somewhat inevitable news. As bombing followed bombing seemingly followed bombing, it was announced that the ICC Champions Trophy would not go ahead as planned in Pakistan last month. Arguments over the legitimacy of security concerns were many, varied, complex and subject to change almost by the day. But amidst this, it was easy to miss something different altogether. And perhaps something rather sad. Very few tears were shed at the loss (even if it were a temporary one) of the tournament itself. Hardly anyone, it seemed, really cared much for the Champions Trophy. Hardly anyone was disappointed not to be seeing the eight serious cricketing nations go head-to-head. All its life the tournament has retained a somewhat confused air (even the title has not been straightforward: the first edition was in 1998/99, under the alias “Mini World Cup”; then in 2000/01 it was the ICC Knockout Trophy; finally the organisers settled on the current name which has survived 2002/03, 2004 and 2006/07 so far) so perhaps the indifference is not so surprising. Initially it was marketed as a tournament to raise funds for developing cricket nations – the first two were held in Bangladesh and Kenya, and in fairness some reasonably interesting cricket was played in both, and the first was rapturously received by home fans. This soon changed, and recent editions have been held in Sri Lanka, England and India, and now hopefully eventually Pakistan. There now seems to be some form of attempted suggestion that the tournament is in fact the second most important in world cricket. Yet empty stadia have been a common sight at all since the first, though the fact that TV stations are and have remained willing to invest hefty sums for coverage rights suggests the crowds do not tell the full story. The essential problem appears to be that the tournament is not taken seriously enough, by anyone. ICC have habitually scheduled it for September (though sometimes it has found its way into October), reasoning that this is the only month when there is regularly no international cricket. Indeed there isn’t, and for good reason – the weather is unsuitable in just about every cricketing country: it is generally wet in the Cape in South Africa, as well as most of the Caribbean; the monsoons likewise make much of the subcontinent unreliable and resulted in the Sri Lankan leg in 2002/03 producing no winner; Australia and New Zealand, as well as being somewhere where cricket is barely even mentioned in the month due to various football finals, are still in early spring; and the 2004 event proved conclusively that it is far too late in the British Isles (the final was held after the Autumnal Equinox, and was played in ridiculously dark, damp conditions – not that this precluded a thrilling finish). So if ICC or any of its members are actually serious about making the event the second-biggest in the cricket calendar, they must first stop simply shoving it into a gap which is most certainly not cricket-shaped. Many would much prefer to see the Champions Trophy removed entirely. This would be a phenomenal waste. After all, consider this – in each September-to-September calendar year since the tournament was first played, the following number of ODIs have been conducted in bilateral and tri-series: 1998/99 – 96; 1999/2000 – 124; 2000/01 – 111; 2001/02 – 126; 2002/03 – 104; 2003/04 – 109; 2004/05 – 89; 2005/06 – 138; 2006/07 – 120; 2007/08 – 126. That is 1143 games (and these tallies exclude matches which have been washed-out completely – plenty more were scheduled). With a few exceptions, most fans will barely be able to recall what happened in such games a year after the event, never mind 10. ODIs are an essential part of cricket and this is no attempt to devalue them or suggest they should not be being played at all. But rarely is there any ODI cricket which sticks firmly in the memory, where any serious cricket follower will recall with clarity what happened for the rest of their lives. Except, usually, World Cups. In many countries, non-World Cup ODIs are seen purely as building blocks to each global showpiece. Yet World Cups are held only once every four years – an eternity in cricket, as opposed to in football (that is, soccer) where a World Cup lasts a whole two years through qualification before a concentrated finals stage, and most continents hold their own championship in the two years in between times which are virtually every bit as high-profile. The long delay between World Cups means that ODIs simply need something else in the meantime. Another folly of ICC’s has been holding a MWCKTCT six months before a full World Cup – the biennial nature of the thing makes this inevitable. If the World Cup was held every 4 years and the Champions Trophy every 4 in between, both tournaments would have far more lustre. ODI cricket needs a tournament every 2 years which involves all the big teams, if it is to retain credibility as a format. This tournament needs to be a tournament which is taken seriously by all involved – organisers (that is, ICC and whichever board is hosting), players, officials, broadcasters, and anyone else who might play a part. In every MWCKTCT so far, there has been to varying extents a lack of this – in 1998/99 England, about to start a gruelling Ashes tour, sent a team that was somewhere between a second and third eleven, and as enthusiastic as the Bangladeshis were the fact that one ground staged all the matches meant the pitches were invariably slow, leading to many tiresome 15-over-slogs-followed-by-35-over-slugs. In 2000/01, little marketing was done and similarly little to further the cause of local cricket and empty stadia resulted. In 2002/03, aside from the woeful schedule (involving both time of year and the number of mismatch-inducing teams involved), a trial was conducted on third-umpire referrals and once again grounds were mostly empty. In 2004, the impact of the weather was arguably even greater, the impact of substandard teams equal, empty stadia yet again abounded, and the hosts (England) wasted a potential chance to erase memories of a woeful showing in their own 1999 World Cup by putting-on a shambles of a tournament that meant their march to the final was barely noticed (and the ground itself was so dark it’s highly questionable anyone noticed their defeat there either). The 2006/07 event easily outstripped anything else, with a good format which worked as planned (substandard teams were eliminated early with minimal fuss) and pitches which produced some varied cricket. The only downsides were that matches were often over too quickly, so much was there of times in it for the bowlers, and that apart from when India were playing crowds were few. And in all events, the maximum number of stadia used has been three, at the insistence of the televising company, thus denying the home country the chance to spread the gospel and encourage potentially fuller houses due to the rarity value. If enough people are not willing to take the Champions Trophy seriously enough, then there is indeed no point in holding it at all. The international calendar is ridiculously overcrowded as it is, it has been this way for many years now, and there is no room for half-hearted exercises whose only vague point is to make a short-term profit for the hosts and ICC. 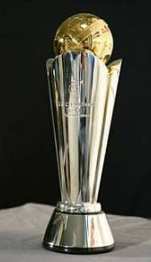 In my view, the Champions Trophy is an event with huge potential – infinitely greater than that of any bilateral or tri-series, or any Twenty20 tournament. But this will not be realised if it is treated with the disdain that has so often been thrown its way. [QUOTE=Richard;1694814]The ICC Champions Trophy has had an often-troubled existence. Yet it is a tournament that potentially offers an unbelievable amount to the game of cricket and which perhaps quite a few people need to start taking more care of. [QUOTE=stumpski;1694862]You’re thinking of the Champions League, aren’t you – one of these Twenty20 shindigs? I agree that it depends on what you think the point of ODIs is. A very good question! I was brought up on (pretty much) one touring side per summer. Part of the enjoyment was getting to know that team in detail throughout the summer, in all forms of the game. You’d have a few county warm-up games which you’d follow in the press. You’d then have 3 ODIs where you would get to know the other side’s players. The promise of a “psychological advantage” would add some lustre to these games, as would the fact that the main course was yet to come. And because these were ODIs you might have some Test hopeful getting a try-out in the ODI team first. Bilateral series which follow the Tests by contrast tend to have a distinct feeling of “after the Lord Mayor’s show”. And bilateral series that stand alone – ie where the touring team arrives simply to play an ODI series – seems to me pointless. I can understand your point about ODIs being preparation for the World Cup, and this is one way in which they are indeed looked on by the powers that be. However, at least from my perspective as an England supporter, this always has an air of complete unreality about it. England’s selectors rarely seem able to select a consistent side for ODIs, and are usually blindly groping for rabbits from the hat a matter of weeks before the World Cup. Besides, I feel that focussing too much on a far-off World Cup, where the stages which matter are in a knock-out format and therefore inherently unpredictable and governed to an uncomfortably large extent by luck, is unwise. But to return to your point about the Champions Trophy: your point seems to be that ODIs need a purpose, therefore we should have something in addition to the World Cup for them to be the build-up for. This seems to me to be putting the cart before the horse, particularly given that the CT has proved to be as unpopular as it has. [QUOTE=GingerFurball;1696117]I’m not so sure. I think the fact that Australia played an ODI series in India last season means that this tour is about the Test series, and the Test series only, which means it can be spaced out over a longer period of time, allowing the Australians more preparation time, and hopefully leading to a higher quality of series, instead of cramming in the 4 Tests as quickly as possible to fit in a 7 game ODI series afterwards. Personally I felt that the 3-match ODI series before the Ashes began was a series too far. By that stage we were all ready for the Tests to begin, even though (IIRC) the ODI series had quite an exciting conclusion. this many number of ODIs after 5 test series is ridiculuos….. They shud seriously start thinking of scheduling test and one dayers separately at different times of the calendar or even in different seasons. Even when both are on the same tour, for most of the teams half the ODI squad had to be flown in at the end of the test series…so why dont schedule the ODIs at a totally different time? May be then we escape from hearing things like, ” some of our guys are still in the test mode” — hate that terminology test mode and one day mode….